Put away those Bitcoins, folks. 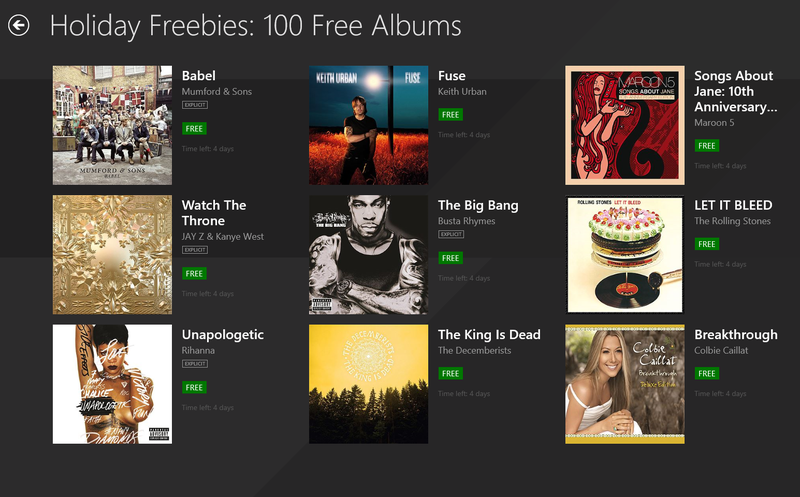 After dishing out 100 free, full albums during Black Friday weekend , Microsoft’s at it again, giving away another 100 full albums for the low, low cost of absolutely nothing through December 15. The Microsoft Music Deals app highlighting the free albums is also offering 80 percent off numerous holiday albums and many of the top albums of 2014, selling the latest music from Maroon 5, Lana Del Rey, Weezer, and others for $1.99. The terms of the deal are the same as before. You’ll need access to Microsoft’s Music Deals app to see the freebies, which then bumps you over to the Xbox Music app when you select a free album—meaning you’ll need Windows 8 or Windows Phone 8. You’ll also need a Microsoft Account to snag the songs. The last giveaway was a U.S-only deal, and it's very likely this one is as well, though I've yet to confirm that. Once you claim the albums as your own you’re able to download the tracks as DRM-free MP3 tunes, so you’ll be able to listen to them on virtually any device—even ones that Xbox Music fails to call home.